If you are studying ants or other insects, there are some excellent books about ants for kids that would be wonderful to read as part of your studies. 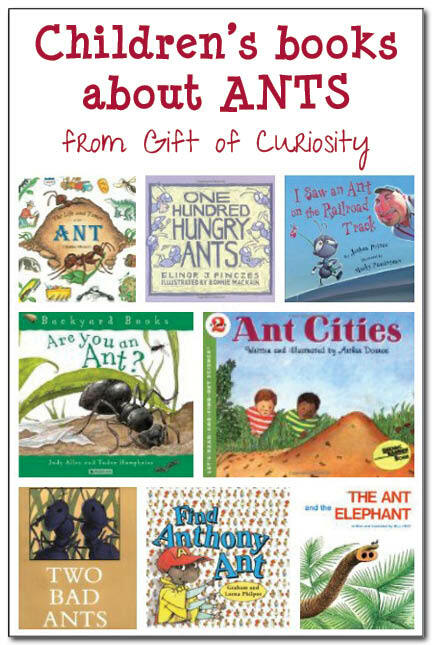 Below I have reviewed three non-fiction and five fiction books about ants for kids. This was by far our favorite ant book. Although geared toward kids a bit older than mine, both of my kids were very engaged with this book and asked to read it over and over again. I felt it had just the right amount of factual information for my kids to learn about ants without being overwhelmed. Plus, even I learned a lot about ants from reading this book! The book focuses on the harvester ant (which, appropriately enough, was the kind of ant we had in our ant farm). From this book we learned about the eating habits, tunneling habits, and life cycle of the harvester ant. We learned about queen ants, worker ants (which are all female), and male ants. The last few pages of the book describe other kinds of ants. If you are doing an ant farm and ordering live harvester ants, this would be a great book to have. But even if you aren’t going to be observing harvester ants, I still highly recommend this book as a great educational tool for kids. This is a fantastic book about ants, but it is even more densely packed with information than Ant Cities, so it is probably best suited toward elementary students rather than preschoolers. This book contains sections that describe the ant family, life inside an anthill, the ant’s anatomy, how ants use scent trails to find food, the life of an ant through the months of the year, threats to ants, and much more! This book provides an excellent primer on ants for the interested young reader and would be a great addition to your collection of books about ants. This book begins with the question, “Are you an ant?” This book is written directly to the reader, who, for the sake of the book, is assumed to be an ant. The book describes for the reader how an ant is born (“The queen begins to lay eggs. You are in one of them.”), the ant life cycle (“Soon you must change into a pupa.”), and what ants eat (“Go out and hunt for food. Seeds are nice. So are bugs.”), among many other interesting facts. The writing style will encourage young readers to really think about what life would be like if they were a black garden ant like the ones described in the book. This book presents fewer details than The Life and Times of the Ant. That, and its humorous approach, may make it more appealing to younger children, although elementary students are also likely to benefit a lot from the information presented in this book as well. One hundred ants were singing and marching in a row to get to a picnic. But the littlest ant stops them, explaining that they are moving much too slow and would arrive sooner if they march in 2 lines of 50. So the ants do as suggested and continue marching on to the picnic. But the littlest ant stops them again, explaining that they would arrive sooner if they march in 4 lines of 25. So the ants do as suggested and continue marching on to the picnic. But even this isn’t fast enough, so the littlest ant stops them again and has them march in 5 lines of 20. Eventually the ants reach the picnic, but the food is gone! The ants are angry that they missed their picnic, and they blame it all on the littlest ant. What will they do to the littlest ant now? This is a delightful rhyming book with an adorable storyline full of suspense. In this book we meet Jack, whose job is to switch trains from track to track. As he sits one day to eat his lunch, he notices “an eastbound ant on a westbound track.” When he hears a train in the distance, Jack tries to switch the tracks so the train won’t smash the ant, but he encounters a lot of difficulty. Is the ant doomed to be squashed by the oncoming train? This book was originally published over 40 years ago, but the themes of kindness and helping others still resonate today. The story begins with an ant who falls into the river. Feeling stuck, he asks a nearby turtle to help him out of the water. But the turtle refuses to help. A moment later, however, the turtle falls on to his back. He asks a nearby bird to help flip him over. But the bird refuses to help. A moment later, however, the bird’s egg falls from the nest and she can’t retrieve it. She asks for help from a giraffe passing by, but the giraffe refuses to help. On and on, the animals find themselves in a jam with no one willing to help them. Finally, a kind elephant comes by and helps all the animals. He plucks the ant out of the water, flips the turtle back on his feet, puts the bird’s egg back in the nest, etc. Only the ant thanks him, however. The other animals simply walk away without a word of gratitude. As the elephant moves on, feeling very good about himself and a bit smug for having helped so many others, he falls into a deep ravine and gets stuck. So who will rescue the elephant now? 95,000 ants come to the rescue! What I liked about this story was the notion that even tiny little ants, when they work together, can help a big elephant. I was disappointed to see, however, that the ungrateful animals did not learn any lesson from their experiences. Finally, I wish the lion had not used the word “stupid” as this is a word we strive to avoid using in our home. This fun tale follows a colony of ants in search of some crystals to feed their queen. They take a perilous journey through the night to reach the crystals, each gathering one and heading home to feed it to the queen. However, two ants enjoy the crystals so much they decide to stay behind rather than return to their ant tunnels. The text, told from the perspective of the ants, tells of the harrowing day these two “bad ants” experience. They take a terrifying fall into boiling brown lake. They nearly drown under crushing waves. They almost burn to death before being flung into the air. And they take a good beating in a whirling storm. While the text tells the story from the ants’ perspective, the illustrations tell the story from a human perspective. The crystals are actually a giant tub of sugar. The “terrifying fall into boiling brown lake” occurs when a person scoops some sugar to put into a cup of coffee. The ants’ near drowning “under crushing waves” occurs when the coffee is stirred. Their experience of almost burning to death happens when they go into the toaster. Kids who are old enough to appreciate the mismatch between the text from the ants’ perspective and the illustrations from a human perspective will find a lot of humor in this book. In the vein of the “Where’s Waldo” or “I Spy” books, this adorable book invites children to search for Anthony Ant. Each spread includes some brief rhyming text and suggestions of three possible things Anthony Ant is doing in the image below. Children are then invited to find Anthony Ant in the ant tunnels. Kids who enjoy “I Spy” types of games will enjoy this book immensely. I love 100 Hungry Ants, that is such a fun book. Actually, since my kids are learning about multiplication, I should drag that book back out again. I was just about to suggest “Two Bad Ants,” when I reread and saw they were there too. You’ve got all of my favorites. Thank you for this list. We also love Hey, Little Ant. I’m not familiar with that book. Thanks for the suggestion! The book,”Amy’s Treasure” by Galina Welchman is an ant story that makes classroom connections on teamwork, co-operation and working together. It touches on all aspects of the curriculum and even snack time (Ants on a Log). Thanks for the tip, I’ll have to check this one out!